Tuesday August 22, 2017: Everyone says goodbye to Joey, Jennifer has a nasty run-in with "Adrienne," and the real silent partner to Dario is revealed. Theo confronts Abe at his cell in SPD. Abe says he’d never knowingly break the law. Theo asks if his father took his laptop so he could cover up that he was working for Dario? Tripp follows Claire into the loft and says he decided not to skip town. He tells her about learning that Joe killed Ava. He came to understand that Ava really messed his brother up. He shares that Joe’s turning himself in. Claire realizes that’s why she was invited to the pub later. To say goodbye. At the Brady’s pub, Roman is supportive of his nephew and gets why he needs to turn himself in. Kayla says she’s finally accepted this. Joey asks her to stop pushing his father away. He’s afraid to go to prison but it’ll help knowing that his parents are together. Roman gives brotherly advice for Kay to lean on Steve. She’s not sure if she can. Steve appears at Salem Inn and knocks on Adrienne’s door, calling her name. Inside, Bonnie quickly looks through the notes to find out more about Adrienne’s brother then lets him in and calls him Patch. He’s surprised. It’s been a while since she called him that. He hugs her. He needs her. He feels like his life is falling apart. Bonnie asks why and he fills her in on Ava’s death and the cover up. She acts surprised but tries to cover. Steve is puzzled but moves on to tell her Joey killed Ava and that he’s going to prison. Bonnie gasps. “Oh he can’t go there. He could run into…” She catches herself. She tries to act supportive. He asks her to come to the pub to say goodbye. She tries to get out of it to no end and when he says Lucas will be there, she admits she dumped him for Justin. Shocked, Steve assumes that’s why she’s acting odd. At SPD, Raines and Hope have a press conference to talk about Abe. Jenn confronts Hope. Something else is going on. Abe would never get involved with crime. Hope won’t meet her eyes. Justin appears as Abe’s lawyer but Abe has one. Justin tells Jenn that Adrienne left Lucas and reconciled with him. Jenn and Hope gape. Jenn runs off to call her brother while Hope suggests Justin take things slowly with Adrienne, worried he’ll get hurt. Late for a press conference, Eli runs into Julie at Martin House. She’s furious with him for having Hope arrest a fine upstanding citizen like Abe and she wants her house back. Eli assures that the Salem PD is on the case. If things don’t work out properly, she can kick him out. Steve arrives at the pub. Joe goes to help Roman and the parents discuss Joe turning himself in. Steve knows their son will make it through this. Kayla cries. Steve knows it was bound to happen. Joe was never going to be at peace. Steve wishes he would have thought more about the impact of bringing Tripp to Salem. Steve can’t lose her again. Kayla apologizes for going too far in their disagreement. He begs her to tell him it’s not over between them. She can’t imagine getting through this without Steve. Joe returns and they share a group hug. At the loft, Claire talks about still being friends with Theo but gets down on herself for screwing things up. Tripp tells her she helped him a lot. She hugs him, glad. Theo appears. He tells them that his father says he’s innocent. He doesn’t want to discuss it anymore. They leave Tripp for the pub. Back at Salem PD, Eli appears and asks Hope and Raines if Abe has changed his story. He hasn’t. Eli says it’s hard to believe an admired public figure could abuse his status for his own gain. He and Hope share a glance and Raines says he couldn’t agree more. Eli goes to see Abe who says he hopes he hasn’t made a terrible mistake. Eli says he will only have to play this role until Dario’s silent partner – Commissioner Raines – feels at ease. Julie and Hope arrive at the pub. Julie’s angry that Eli forced her to arrest Abe. Hope doesn’t blame him. She hopes once the evidence is in that he’ll be cleared. Bonnie walks in and Jenn questions the break up with Lucas, calling it heartless. “Adrienne” says who is Jenn to say anything? She’s hooked on pain meds. Jennifer gasps and reminds her “friend” that she’s been in recovery. “Adrienne” apologizes. Justin appears and Jenn can barely speak. Hope, Kayla and Steve watch “Adrienne” kiss Justin, jaws on the floor. Justin and Bonnie go back to her room at Salem Inn. Justin tries to make love to her but she refuses. Joe goes to see Tripp at the loft. Each is sorry for everything. Joe asks his bro to take care of his father while he’s gone. The men embrace. Steve brings Kayla to the hospital to remind her of Joe’s premature birth. All they could do is watch through the window and hope he was a fighter. Now they’ll have to do it again. Steve and Kayla find Joe at the loft and take him to the police together. 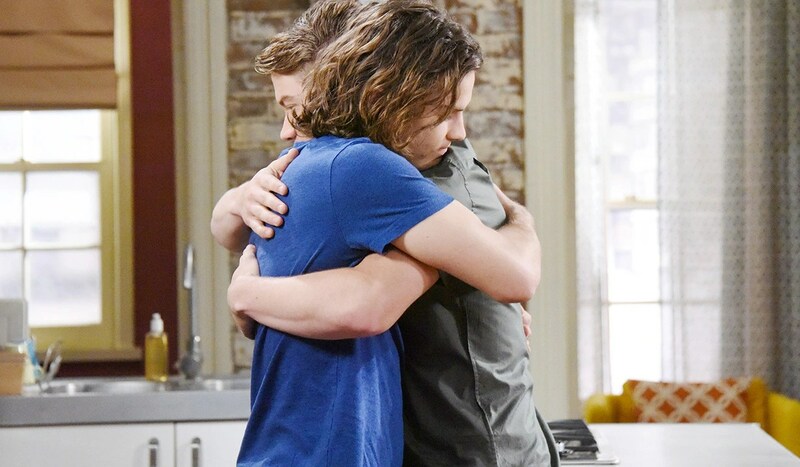 Chad and Sonny realize they’ve the same question for one another.